The date of this photo is unknown but is believed to be on or around July 1, 1955. If you have any insight into the true date this photo was taken, please leave a comment below. This photo was taken by David Tewes and is licensed under the Creative Commons - Attribution license. The black convertible, to the left of the walkway (“our” side of the street) is a 1941 Plymouth, P12 Super Deluxe. I think the car in the front row on the right is the newest of the group. That fastback style started appearing around 1946-47 and was already dated by 1950-51. A lot of the GM cars (Chevy, Pontiac, Buick, Oldsmobile) had that type of fastback design. I’m guessing that car is c. 1948-49. 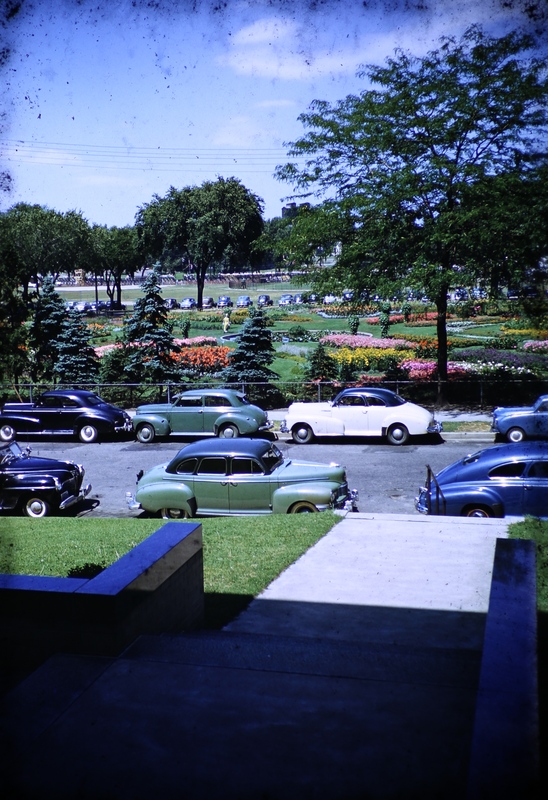 That blue fastback is (I think, after looking at a lot of cars) is a 1948 Pontiac Silver Streak (which, I’m not really sure if that’s the same thing as a “Streamliner”, with a little different options?). The Crosley to the far right facing left is no newer than a ’48. The blue car to the far right of the picture near the stairs that’s cut off looks to me like a 1940’s Pontiac Streamliner Torpedo. All the cars in that photo are ’40s. I don’t see anything in the ’50s. White and black in the top left are 46/48 Chevy coupes. Green in the front/center is a Nash Ambassador. The one at lower left is a 1941 Plymouth. The pale green one in front of it appears to be a 1946 (?) Nash. 1940’s cars are difficult to pinpoint at a glance because automakers stopped production in 1943-1945 to devote manpower and factories to the war effort. And with so many of their engineers and designers off at war, they didn’t have redesigned models lined up when production resumed. Thus, many 1946-1948 models are basically leftover designs from 1941-1942.